“Mind the dung” are among the first words spoken in Universal Limited Theatre’s production of Japanese Problem. Coupled with the pungent smell of animals who have recently vacated the livestock buildings at Hastings Park, it is a stark reminder of where we are. It is also a graphic introduction to a sometimes powerful experience. Referred to as a historical re-enactment by one of our guides for the show, the descriptor does not give full justice to Japanese Problem. For while there are actors who recreate historical characters and scenes, at times it goes much deeper. Before delving into Japanese Problem though, it is important to have some background. In 1942, following the bombing of Pearl Harbour, some 8,000 Japanese Canadians were sent to Hastings Park. It became a way-station for many of the 14,000 who were forcibly removed from their homes, before being sent to internment camps in British Columbia’s interior, or other work camps across the country. While this basic knowledge is helpful, to fully appreciate Japanese Problem takes a deeper understanding of its subject matter. For while the collaborators on this project do a nice job in helping to maneuver the audience through its story, there is so much more than this all-too-brief 40 minutes allows. A recommended online resource is Hastings Park 1942, and well worth visiting before, or even after, taking in the show. …like the smells that seep into your clothes from having spent time inside the livestock building, Japanese Problem will linger. 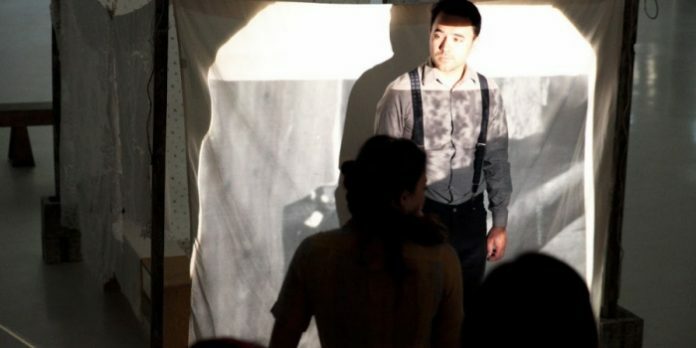 Based on interviews the creative team conducted with actual survivors, the ensemble – Yoshie Bancroft, Daniel Deorksen, Brent Hirose, and Nicole Yukiko – not only take on roles for the re-enactments, but also bring a personal connection to the material. Bancroft, Hirose and Yukiko are of Japanese descent, while Deorksen has the unenviable task of representing the white man’s part in this dark piece of Canadian history. On a number of occasions the actors step outside their characters to react as themselves to what is happening. It is this juxtaposition of the personal with the historic which ultimately makes Japanese Problem so compelling. “I don’t want to do this”, says Yukiko at one point. As the nurse she is being asked to take a crying baby to the infirmary. At Hastings Park, this is referred to as the “dungeon”, a dark windowless room, where sick children were held until they were well enough to return to their living quarters. To illustrate this section of the play, the ensemble uses shadow puppets. There is a duality at play here, with the childlike playfulness of the puppets, against the backdrop of the reality of the infirmary. Shadows feature prominently in Japanese Problem, a metaphor for the faint memories of the survivor’s stories which are the basis for the show. While the mix of storytelling techniques used keeps things interesting, it is the physical re-enactments where the emotional core comes into full focus. In one exquisitely realized scene, the reality of the situation by both captives and captor is excruciatingly real. It is an anguishing moment of pure humanity. But while the bulk of Japanese Problem remains compelling, there was also some confusion at times where we should direct our attention. At one point we even overshot the next scene as we followed one of the actors (although we were quickly put back on-track). The live and recorded music, and the Foley effects are sometimes overpowering. Some of the connections, both personal and as mirrors to modern realities, also felt forced. This was particularly evident in the penultimate scene as the actors begin to unravel, not sure if they could complete the task at hand. Some of those connections though, are profound, including a reminder that what was called internment in 1942 would be considered incarceration in 2017. There also remains the question of how much an audience must know going into the show. While it may be a catalyst for discussion and future investigation, there is a lack of detail at times, especially in a show of this length. Perhaps future iterations will flesh out some of the missing pieces. But these are small criticisms inside this impactful piece of immersive theatre. And like the smells that seep into your clothes from having spent time inside the livestock building, Japanese Problem will linger. The current run of Japanese Problem is sold out. 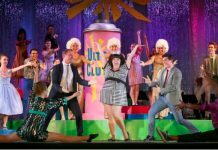 A touring production is planned, but there is little doubt witnessing it in the livestock buildings at Hastings Park has a deeper impact. Hopefully a re-mount will be possible to allow more people to see this important work. Japanese Problem by Yoshié Bancroft and Joanna Garfinkel. Directed by Joanna Garfinkel. Playing in the livestock barn at Hastings Park (188 N Renfrew St, Vancouver) until September 30. Visit http://japaneseproblem.ca for more information.